As WWII began in Europe, and it was clear that America could be drawn into the war, it was decided that the US Army must develop a self-propelled gun. Engineers enlisted the WWI veteran: the French 155 mm gun as their choice. 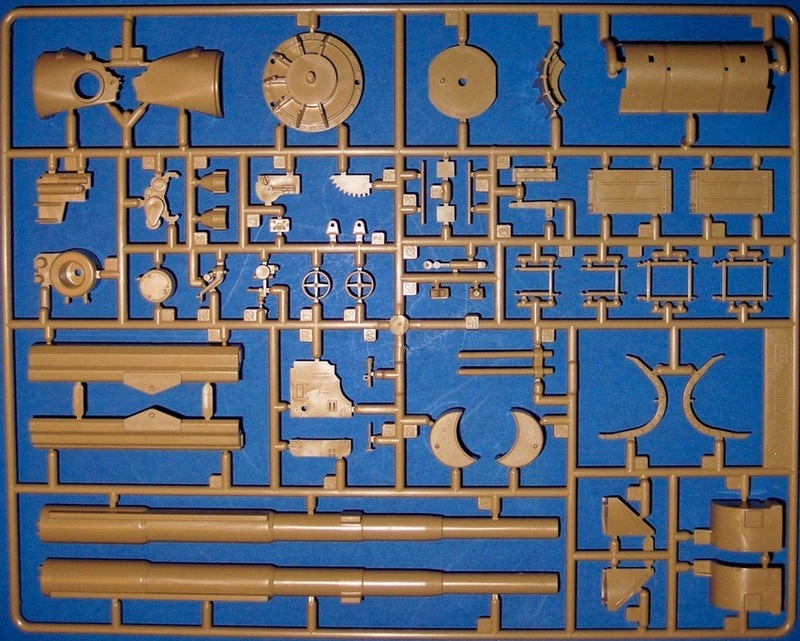 They also chose the M3 Lee tank chassis as the basis for the design. The M12’s ordered were used for training purposes only. In 1943, with the invasion of Europe imminent, the US Army decided to have the M12’s upgraded for possible use in the overseas theaters. The heavier suspension of the M4, with rear mounted return roller, was used to modernize the vehicle. Baldwin Locomotive Works, the company updating the units, also mounted a small shield on the gun mount and removed the co-driver’s hatch. With an elevation of –3 degrees to +35 degrees, and traverse capabilities of 28 degrees to 14 degrees, the 155 mm gun on the M12 carried ten rounds of artillery and had a maximum range of 15,200 yards. A 353 hp air-cooled Continental R975 radial engine yielded a maximum speed of 24 mph. In June of 1944, they were sent to Europe and used for several major battles including the taking of Cologne. Academy is a model company based in Seoul, Korea. 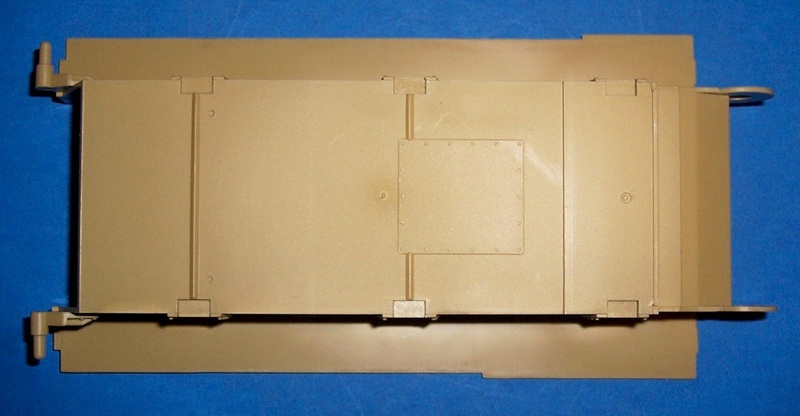 They market numerous other AFV model kits. Their US distributor is Model Rectifier Corp. in Edison, New Jersey. The kit comes in a tray and lid type box. The box art shows a M12 in a grassy clearing in a woods. There is the nose of a second M12 sticking out that is parked behind it. The one in the foreground is in overall olive drab. It has a white shield on the side that has a row of 3 red stars at the top and two horizontal red stripes below the stars. To the right of the shield is the word “June Gil” in white. To the right of that is the words “Avant Le Char de Mort” (Forward, Tank of Death). This slogan is also in white. The two slogans appear to be hand painted, probably with whitewash. Below the second slogan is the serial no. US 4081019 also in white. This vehicle is with the 987th Field Artillery Battalion, supporting the attack on St. Lo, France on July 16th 1944. (marking is on the decal sheet in the kit). The other side panel has a single color photo of the model made up and in a diorama setting. However, the serial no. shown on it is US 40145192, and this marking is not on the decal sheet. 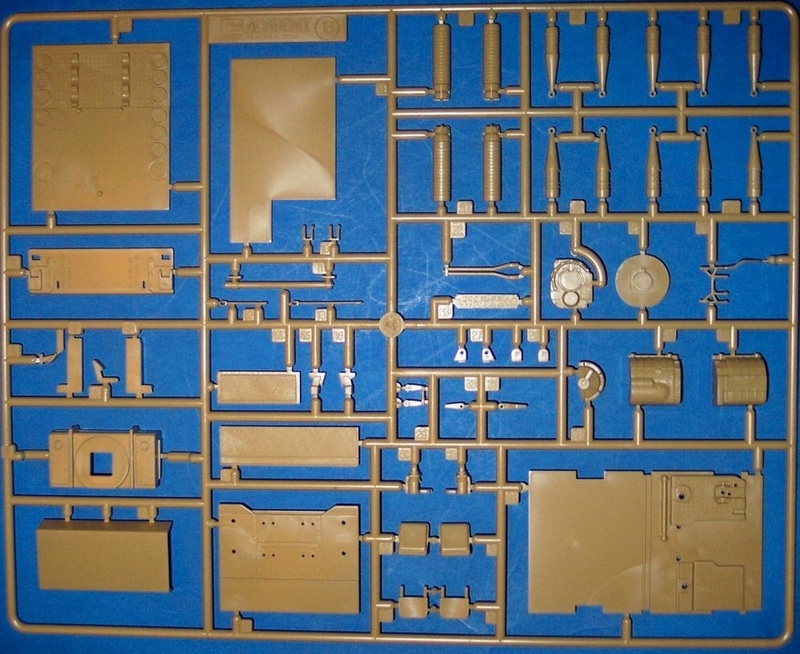 Next to this photo are listings of what’s in the box and what is not and that the kit is aimed at modelers of 10 years and older. These lists are labeled with the flags of the countries for 10 languages shown, including English. Academy’s web site address appears below these, with a copyright date of 2000. Inside the box are 6 trees of light tan parts, in 3 sealed cello bags. 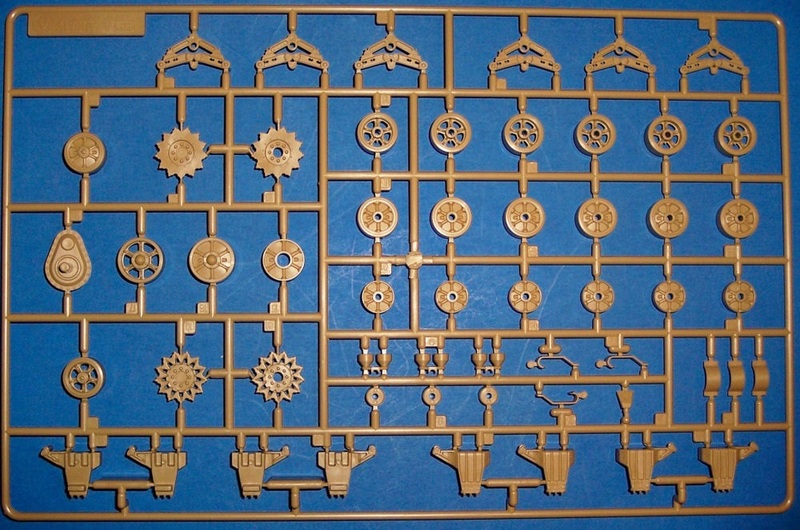 The kit holds 366 parts. 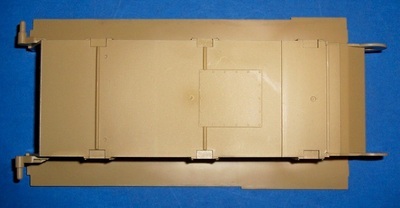 There is a single light tan hull top and a single hull bottom part, also in sealed cellos. There are two lengths of string in the kit. One length is black and the other is white. The decal sheet and the instructions complete the kit’s contents. The instructions consist of a single sheet that accordion folds out into 8 pages of 8 ¼” x 11 ¾” format. Page 1 of the instructions begins with a black and white repeat of the box art. This is followed by the history of the M12 in English, German, Korean and Japanese. Below the history is “Read before you begin” general instructions. Page 2 begins with international assembly symbol explanations, followed by the first 3 assembly steps. Pages 3 through 7 have the rest of the assembly steps, for a total of 15 of them. Page 8 is the parts trees illustrations and a paint color listing. Academy’s web site address and street address appear below these. The kit features a full interior. The recoil spade can be posed folded or deployed. The 155 mm gun will elevate, but I doubt it will be able to rotate without some surgery. There are no crew figures. 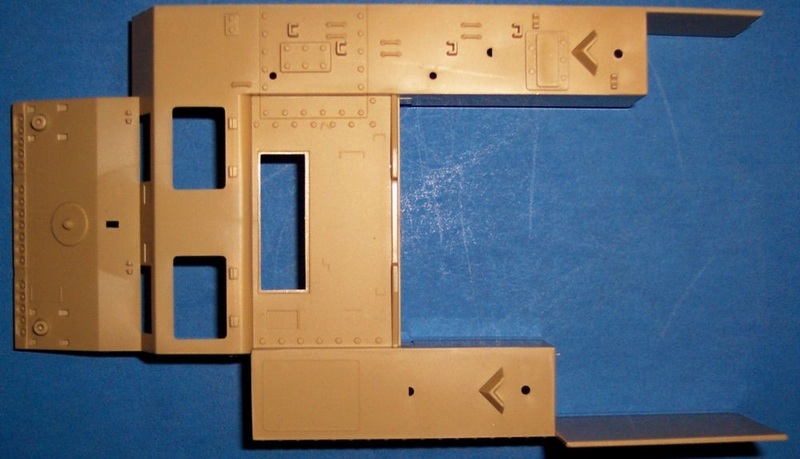 Light tan letter B parts tree holds: 155 mm ammo rounds, transmission parts, driver’s compartment floor, driver and co-driver’s seats, control levers, bulkheads, fighting compartment floor etc. (55 parts). The black vinyl rubber-band type treads have the steel cleat pattern on them and are nicely detailed. However, they are the types that have to be heat riveted together into a continuous loop. Not the newer GLUEABLE type. The final item in the kit is the two lengths of string. One is white and the other is black. These are used as the pulley cables on the recoil spade and for a tow cable. 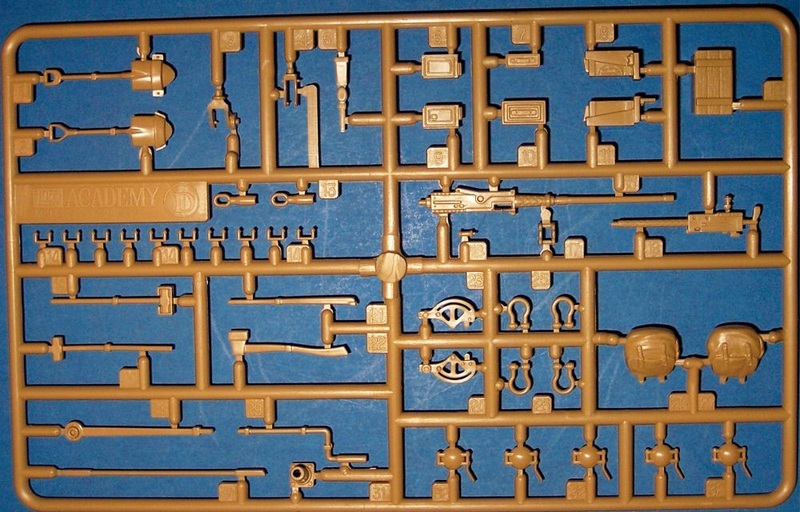 The decal sheet and the instructions complete the kit’s contents. The decal sheet gives marks for 4 different schemes. These schemes are illustrated as 3-views on a single sheet in the kit, that is printed on both sides in 8 ¼” x 11 ¾” format. 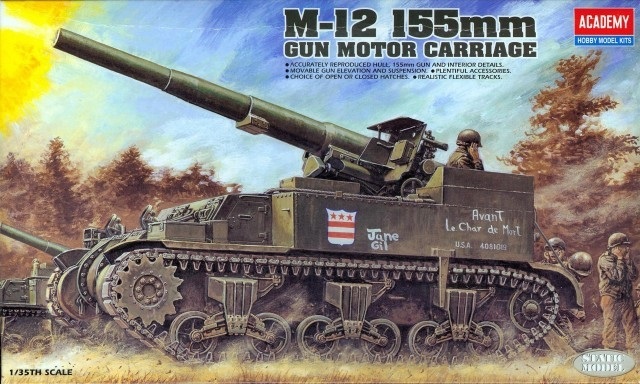 A M12 of the 987th Field Artillery Battalion, with the motto “Avant Le Char de Mort” on the side (the box art subject, already described above). The only other additional info shown here is that the bow of the vehicle has a white star in a circle on it. A M12 also of the 987th Field Artillery Battalion, with the nickname “Corregidor” in white on the side, with a red shield with a row of 3 white stars at the top and 2 horizontal white bars below. It also has a white star in a circle on it’s nose. The vehicle is in overall olive drab. It is pictured as it appeared while participating with the attack on St. Lo, France on July 16th, 1944 on France’s Contentin Peninsula, the attack called “Operation Cobra”. It carries no serial number. A M12 of the 991st Field Artillery Battalion, Kornelmunster, Germany, November 4th 1944. The vehicle is in overall olive drab, with the nickname “Adolf’s Assassin” on the front of the side, It carries the serial number USA 4461046 at the rear of the sides. It has a white star in a circle on the nose too. A M12 of the 11th Armored Division, part of the US 3rd Army, commanded by General George S. Patton Jr., Budesheim, Germany, March 10th, 1945. It too is in overall olive drab. It carries the nickname “Alberta IV” in white letters on the front of the sides, a white star in the middle of the sides and the serial number USA 4051022 in white at the rear of the sides. There is a white star in a circle on the box of this one too. At this point, I want to say that the above schemes are all pictured in the Squadron/Signal publication “U.S. Self-propelled Guns in Action”, Armor Number 38 book. The first scheme is shown in color in the center fold of the book. “Corregidor” is shown on page 37 with a camouflage net over the top of the rear of it. “Adolf’s Assassin” is shown on page 37 and it’s running gear and recoil spade are caked in mud from off-road traveling. Finally, “Alberta IV” is shown on page 39 and it has 2 jerry cans mounted on the left fender. I would suggest getting this book to go with the kit. 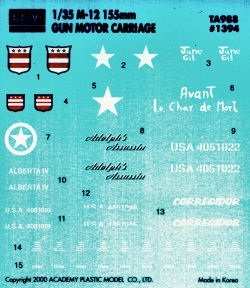 In addition to these marks on the decal sheet, the sheet carries white stencil markings to go on the 155 mm ammo rounds. I am going to add my company’s (Armor Research Co.) barrel rifling PE set inside the gun barrel. This is one highly detailed kit, with great interior detail. 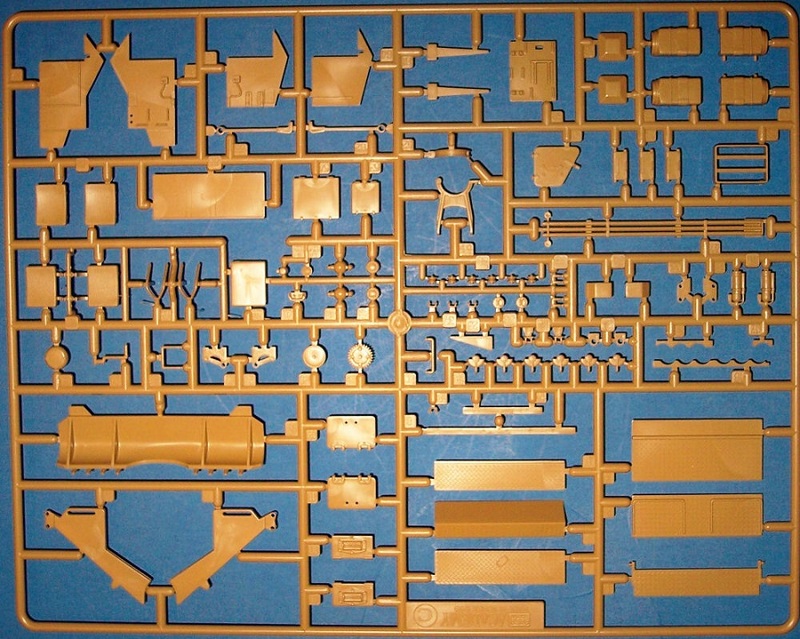 Because of all this detail and the part count in the kit, I highly recommend this kit only to experienced modelers. Kit was courtesy of my wallet at my local hobby shop.